Long-standing records are poised to fall as the polar vortex sends extremely cold air into midwestern and northeastern United States to end January. In addition to the bone-chilling cold, a biting wind will send AccuWeather RealFeel® Temperatures to even lower levels. 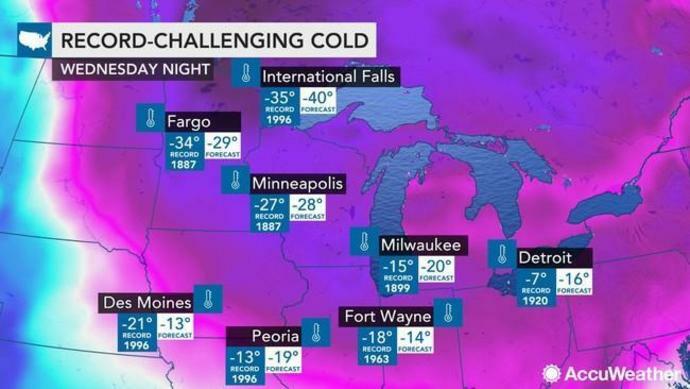 The National Weather Service (NWS) issued wind chill warnings for all of Minnesota, Iowa, Wisconsin and Michigan, as well as most of North Dakota, Illinois, Indiana and Ohio. As the brutal cold invades the Northeast on Wednesday, dangerous snow squalls will threaten motorists with whiteouts on the roadways. A person walks along the lakeshore, Wednesday, Jan. 30, 2019, in Chicago, Illinois. Ice forms along the shore of Lake Michigan before sunrise, Wednesday, Jan. 30, 2019, in Chicago. Ice forms along the shore of Lake Michigan before sunrise, Wednesday, Jan. 30, 2019, in Chicago., Illinois. Ice forms along the shore of Lake Michigan before sunrise, Wednesday, Jan. 30, 2019, in Chicago. A deadly arctic deep freeze enveloped the Midwest with record-breaking temperatures. A man poses for a picture as ice forms along the shore of Lake Michigan, Wednesday, Jan. 30, 2019, in Chicago. A deadly arctic deep freeze enveloped the Midwest with record-breaking temperatures on Wednesday. A Metra train moves southbound to downtown Chicago as the gas-fired switch heater on the rails keeps the ice and snow off the switches near Metra Western Avenue station in Chicago, Tuesday, Jan. 29, 2019. A worker shovels snow off the rail switches at the Metra Western Avenue Yard, Tuesday, Jan. 29, 2019, in Chicago. A warning sign is covered by ice at Clark Square park in Evanston, Ill., Wednesday, Jan. 30, 2019. Geese huddle in the water as the sun rises at the harbor in Port Washington, Wis., on Wednesday, Jan. 30, 2019. A deadly arctic deep freeze enveloped the Midwest with record-breaking temperatures. First responders evacuate a person found in sub-freezing temperatures on the banks of Carter Lake, in Omaha, Neb., Wednesday, Jan. 30, 2019. A tree is shrouded in fog at Northwestern University in Evanston, Ill., Wednesday, Jan. 30, 2019. Commuters braves the wind and snow in frigid weather, Wednesday, Jan. 30, 2019, in Cincinnati. The extreme cold and record-breaking temperatures are crawling into a swath of states spanning from North Dakota to Missouri and into Ohio. Commuters braves the wind and snow in frigid weather, Wednesday, Jan. 30, 2019, in Cincinnati, Ohio. Commuters braves the wind and snow in frigid weather, Wednesday, Jan. 30, 2019, in Cincinnati. A commuter braves the wind and snow in frigid weather, Wednesday, Jan. 30, 2019, in Cincinnati, Ohio. Commuters braves the wind and snow in frigid weather, Wednesday, Jan. 30, 2019, in Cincinnati. The extreme cold and record-breaking temperatures are crawling into a swath of states spanning from North Dakota to Missouri and into Ohio after a powerful snowstorm pounded the region earlier this week. Moorhead, Minn. area elementary school electronic sign shows cancellation of school because of frigid temperature Tuesday, Jan. 29, 2019. Daytime temperatures in the Fargo-Moorhead area were near -20F as Wednesday weather will be even colder. A bank shows a closed sign in front of the door in Northbrook, Ill., Wednesday, Jan. 30, 2019. A deadly arctic deep freeze enveloped the Midwest with record-breaking temperatures on Wednesday. Erie County Executive Mark Poloncarz declared a State of Emergency for Erie County due to the weather, as well as a travel ban that will be effective until 1:00 p.m. local time. "All travel is prohibited. All cars must leave roads," Poloncarz tweeted. Police say at least two people in the Detroit area have died in the extremely cold weather, AP News reports. Ecorse detective Tim Sassak tells TV station WDIV that the man was discovered Wednesday. The man wasn't dressed for below-zero temperatures and wasn't wearing a hat or gloves, according to Sassak. Sassak says police believe the man was disoriented. He was found across the street, near a neighbor's house. Ecorse is located about 15 miles southwest of Detroit. A 70-year-old man was found dead in front of a neighbor's home Wednesday in Detroit. No names were released. Including these deaths, there have been at least six fatalities linked to the extremely cold temperatures in the Midwest. The New York City Emergency Management Department issued a hazardous travel advisory for the Wednesday afternoon commute. "New Yorkers should plan for hazardous travel during the evening commute and are advised to take mass transit where possible, delay travel or safely exit highways or roadways before the snow squall arrives," the press release reads. The advisory was prompted by a NWS Special Weather Statement for a line of snow showers and possible snow squalls in effect for New York City Wednesday afternoon, as an arctic cold front passes through the region. A line of snow showers and potentially squalls will last around 30 minutes to 1 hour will accompany this front. "This intense burst of snowfall combined with strong wind gusts may cause brief whiteout conditions, limiting visibility and making travel extremely dangerous," the press release reads. Due to the extreme cold weather in Chicago, air carriers at O'Hare International Airport have canceled nearly 1,335 flights and have reported minimal delays. "Check flight status with carrier. Stay safe and warm friends," the airport said in a tweet. More than 1,600 flights have been canceled at Chicago's airports as double-digit subzero temperatures cover the region, according to the Associated Press (AP). The extremely cold air has led to a run water advisory in Big Rapids, Michigan, where temperatures have plummeted to subzero levels. The advisory was issued on Wednesday morning by city officials. "The procedure for running water is to open one faucet to a pencil-lead size stream of cold water and allow that faucet to continue running water throughout the duration of the Advisory," the advisory announcement reads. Run water advisories allow water to circulate through the pipes, preventing ice buildup in pipes. Homeowners within the city who are running their water under the advisory are asked to notify the city treasurer's office. According to poweroutage.us, there are more than 36,000 customers without power in Illinois. Additionally, there are over 13,000 without power in Indiana and more than 8,000 in Wisconsin. The impacts to transportation continue to mount due to the brutal cold. "Extreme weather conditions and an abundance of caution have led Amtrak to cancel all train originations to and from Chicago for Wednesday, Jan. 30, including short-distance corridor trains and long-distance overnight trains," Amtrak said in a statement. "Short-distance services are also canceled on Thursday, Jan. 31, and most long-distance services to or from Chicago are also not expected to originate on Jan. 31." Over 1,000 flights have been canceled so far on Wednesday at Chicago O'Hare International Airport, according to FlightAware. The temperature hit minus 30 at the National Weather Service office in La Crosse, Wisconsin. Officials said the reading may be the all-time coldest for the office. A snow squall warning has been issued for parts of western Pennsylvania, including Pittsburgh, until 6:15 a.m. EST. The warning includes portions of interstates 70, 279, 376 and 579. Very poor visibility from heavy and blowing snow is expected, with wind gusts up to 30 mph. "Consider avoiding or delaying travel until the snow squall passes your location," the National Weather Service warning said. "If you must travel, use extra caution and allow extra time. Rapid changes in visibility and slick road conditions may lead to accidents." Ahead of the leading edge of Arctic air, a line of snow showers and heavier squalls is advancing eastward from parts of northwestern Tennessee to western Pennsylvania. This line can drop a quick coating to an inch of snow while drastically lowering visibility on the roadways. The line will advance toward the Interstate 95 corridor from Washington, D.C., to Boston later Wednesday. The temperature in Minneapolis has stayed below zero for over 24 hours, with the current temperature at minus 26. Temperatures will remain below zero through at least Thursday night, making it dangerous for people to be outside for any length of time. Most locations in the Midwest are experiencing actual temperatures in the minus 10s, 20s and 30s at this hour. This is much colder than Utqiaġvik (formally known as Barrow), the northern-most city in Alaska, where the temperature is minus 5. The current temperature in Detroit is 2 F, which is 27 degrees lower than this time on Monday night when it was 29 F. The forecast low of minus 7 on Tuesday night will break the daily record of minus 4 set in 1951. A band of heavy lake-effect snow with snow rates up to 2 inches per hour will push northward over Niagara and Orleans County in New York, before heading towards Buffalo, New York. Early morning commuters will need to be cautious of road conditions tomorrow morning. The U.S. Postal Service announced that delivery will be suspended on Wednesday for Minnesota, western Wisconsin, Iowa and western Illinois. The Minnesota Senate has canceled all hearings for Wednesday. Road conditions will continue to deteriorate into the overnight hours. Illinois State Police report extremely icy road conditions on Interstate 80 between Ridge Road and River Road between mileposts 122 and 125. Wind chill warnings are in effect for all of Minnesota, Iowa, Wisconsin and Michigan and most of North Dakota, Illinois, Indiana and Ohio. Blowing and drifting snow will continue to be an issue across the Great Lakes tonight through Wednesday as frequent gusts of 30-40 mph continue. Winds will also pick up on Wednesday across portions of the Northeast. This will lead to additional blowing and drifting snow. The Interstate-95 corridor could be impacted this evening with a wintry mix followed by a rapid freeze-up. The temperature in Chicago has fallen below zero and is expected to remain below this benchmark for over 48 hours. Although the mercury just dropped below zero, the AccuWeather RealFeel® Temperature has been subzero since 4 a.m. CST Tuesday. This extreme cold has caused hundreds of flight delays and cancellations at Chicago's O'Hare International Airport and Midway International Airport. More delays and cancellations are likely this week at these airports and others across the region due to the extended cold spell. City officials are taking to the streets of Chicago to convince homeless people to go to shelters and warm centers to stay safe during the record-challenging chill, according to the Associated Press. Chicago's Brookfield Zoo is also scheduled to be closed on Wednesday and Thursday due to the weather. This is only the fourth time in the zoo's 85-year history that it has closed. In addition to causing AccuWeather RealFeel® Temperatures to plummet, biting winds are shipping around snow that fell across the north-central and midwestern U.S. on Sunday and Monday. This blowing snow may reduce visibility and cover some roads, leading to difficult travel until the winds subside. If chronic wasting disease in Michigan deer isn&apos;t kept in check it could be &apos;virtually impossible&apos; to get rid of, experts warn. CHICAGO (AP) -- Cubs ace Jon Lester could be close to rejoining Chicago's rotation after pitching a simulated game.